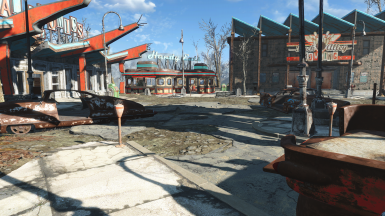 I wanted a cleaner slate to work with for settlement building at General Atomics Galleria but I didn't want to break precombines with a scrapping mod. Also I'm not a big fan of trash piles everywhere or living in filth. I've removed most of the trash piles, dirty decals, blue plastic bins, construction barriers, badly broken objects like shelving units, Mr. Handy parts, and similar items. However some of those things are in precombines and the ones that were are still there. I strongly recommend pairing this with fftfan's General Atomics Galleria Settlement mod. 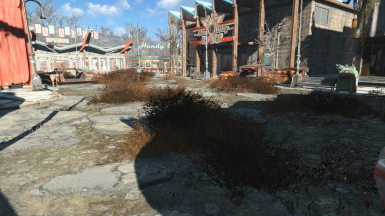 His mod is safe, works properly, and Sim Settlements will work correctly with it. His mod now has proper faction support on the robots. What else does this mod change? I've given the unique Mr. Handy robot NPCs protected status. This includes the Director, all the vendors, and a couple of others. The guards, greeters, and the ones that start off dead in the General Atomics store as part of displays are not unique and not protected. Some of them are however set to respawn in vanilla. Since they are not unique I didn't edit them at all. The details are in the spoiler below such as what I removed, didn't remove, why, etc. What have I not removed because they're in precombines? What have I not removed intentionally? 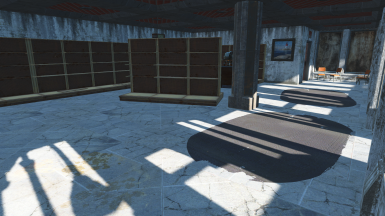 While a lot of items are in a precombine and can't be removed anyway, I left a lot of things alone simply because I intend to use the settlement building mod to make this look like a proper shopping mall. So I want to retain what I can of the vanilla items and use them for their intended purpose. 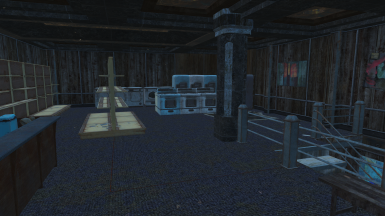 I also left ALL of the junk that can be picked up by the player in place. 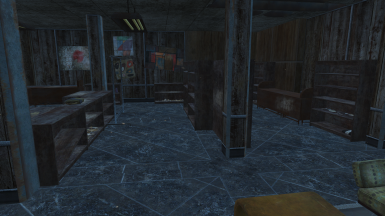 Pick it up and stick it in the workbench (for those using the settlement mod) for resources. 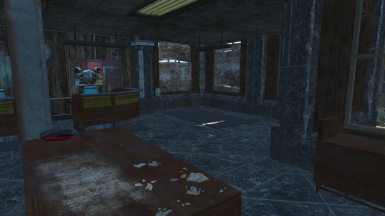 Or carry it to the settlement of your choice if you're not using a settlement mod here. Can you also remove x items? Most likely not. I either can't because it will break precombines or I left it intentionally for other reasons. For instance I decided that removing the gas trap in Slocum's Joe was too risky given that there's a quest and multiple parts attached. With the Mr. Handy in that shop being protected it won't matter anyway, just toss in a molotov from outside to clear it up (aim for the outdoor patio area to avoid hitting the Handy directly). I also left one skeleton behind because it had a note object linked to it (in the Pulowski Preservation Shelter). 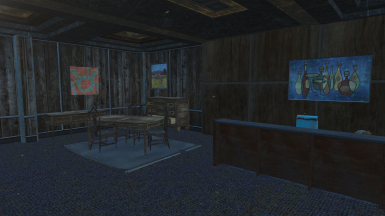 There's a badly busted dresser upstairs in Fallons that I left alone because it had some sort of reference marker linked to it. Most other items I left alone due to personal taste. Why didn't you create scrap recipes so we could get materials instead? Honestly because that's a lot more effort. 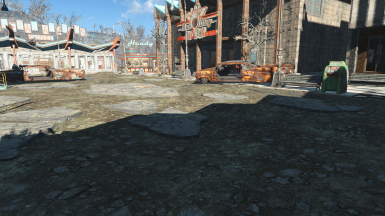 If you don't care about breaking precombines and reduced performance you can always use Scrap Everywhere with the ini setting change that allows you to scrap outside of settlements. I don't recommend Spring Cleaning at all. If you must use a scrap mod use Scrap Everything. What in the world is a precombine and why do you care about them? 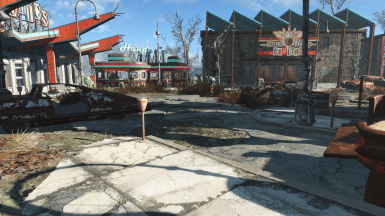 Precombines are part of Fallout 4's performance system. When you break precombines you drastically reduce your performance. If you've got a monster rig you might not notice but low end to medium PC's and console users will definitely notice, particularly in heavily built city areas. Links below if you want to learn more.